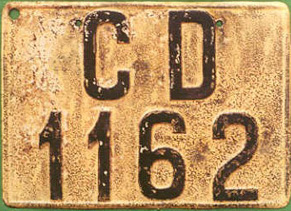 You cannot find diplomatic plates issued before 1984 on the roads because they were all changed in that year with the new ones. Not all the States have got their own embassy with Italy in Italy, but sometimes it's even located in other countries: in this cases they haven't got Italian siplomatic plates. 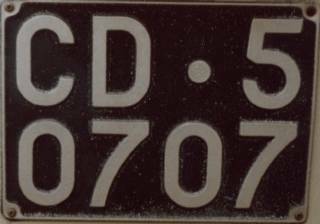 1909-1936: diplomatic plates were the first special plates introduced in Italy. From 1909 to 1936 they had the letters CD followed by a serial number assigned by the Ministry of Public Works with black on white characters. Marcello Taverna told me that it's likely that these plates were owner provided: for this reason they were often different from each other and I'm not sure that the plate showed in the first picture is of this kind, even if it's likely. 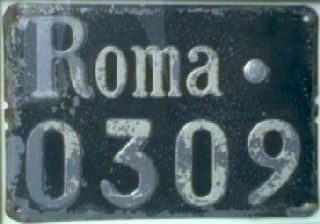 1936-1944: at the beginning, from 1936 to 1944, they had the print "Roma" with a leading zero used to distinguish them from normal plates, as you can see in the second picture. 1944-1951: then from 1944 to 1951 they had the letters CD and just a serial number, with the same numbering for all the diplomatic corps, with white characters on black. Unfortunately at the present time I haven't got any picture of these plates. 1951-1974: last in the 1951 a new system to distinguish the origin was introduced and the format was CD 12345. The first digit was "1" if it was for an Embassy of Italy (pictures number 3 and 4: note that they are a matched couple) and "2" of Vatican (picture number 5); the second and the third digits showed the origin and you can find a full list of codes in the table page, then the forth and fifth digits were serial and issued from each Embassy. For some new countries and for those countries that needed more plates, the "5" was used in first position (you can check it in the table page and see a picture of such a plate clicking here). The digits "3" and "4" in first position were issued in some special cases, like for international organizations, but I don't know anything about them. There are some doubts about the year when this system was introduced and it's possible that it started being used in 1957: if you want to learn more about this, go to the table of codes where the reasons of this doubt are explained better. 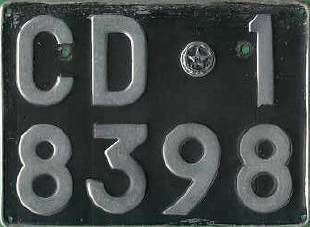 The plates were made of metal, with silverer digits on black, and the small circle that you see after the letters CD is the seal of the Italian Repubblic, already present in all the plates of cars. Anyway, from 1951 and 1974, the style of the plates changed some times: you can see another plate of that time clicking here. Rear plates had two lines (278 x 205 cm), while front plates just one (390 x 86 cm), as you can see in the pictures. 1974-1984: in 1974 (even if they started being issued in 1976) the diplomatic plates changed the look, but not the numbering system. The new plates were made of plastic, white on black and with the letters CD on back plates arranged vertically in a column (fifth picture). 1984-1995: diplomatic plates totally changed in 1984 to become almost as they are today, as you can see in the picture number 6. CD stands for "Corpo Diplomatico" and the last 2 letters indicate the Embassy code, while the numbers in the middle are serial. There is no difference between plates of embassies of Italy and of Vatican. Close to the top side you can see the seal of the Italian Republic and the "I" in an oval. 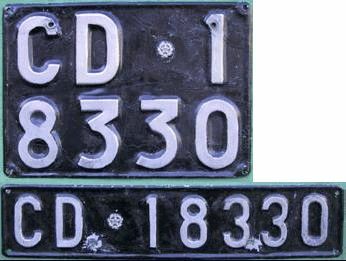 In 1992 diplomatic plates were lightly reduced in width, from 4.6 x 13.6 to 4.36 x 13.6 inches. You can find a full list of diplomatic codes in the table page. 1995-Today: diplomatic plates have had four serial numbers since 1995 (picture number 7), but their numbering system and the look didn't change at all. Anyway they are very uncommon and it seems that plates with just three numbers are still in use. There have never been diplomatic plates for motorbikes in Italy. I need to thank Guglielmo Evangelista so very much for his help, Alessandro Libanore for the first, the third and the fourth picture, and Marcello Taverna for the fifth!